We're growing fresh shrimp...in Kansas. Until further notice, Sunflower Shrimp will be open by appointment only, and calling ahead to reserve your shrimp is highly recommended. Orders will be filled according to the order in which they were received. All pre-orders and scheduled tours on the books will occur as planned. Thank you for your patience. The demand is growing faster than the shrimp. ​What's new with Sunflower Shrimp? ​​Sunflower Shrimp is pleased to announce we are a participating vendor with the Morning Harvest CSA for the 2018 season! CSA shares will include Sunflower Shrimp the first week of every month as one of their meat items in their weekly boxes. Visit morningharvestfarm.com for more details. ​We now have enough production to potentially support contracts with a few restaurants who would like to offer Sunflower Shrimp on their menu. Please spread the word and call if interested. 1.) We take credit cards and cash. The shrimp cost $18 per pound + 7.5% sales tax. 2.) Our address doesn't always show correctly in Goggle/GPS. It will get you to Sumner/Oxford Road, but sometimes doesn't show the correct final location. If it stops you to the Coop, keep going south another 2 miles. 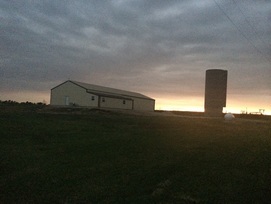 ​ We are located at 360 S Oxford Rd., Oxford, KS - which is 2 1/2 miles south of Highway 160 (Wellington/Winfield exit off the turnpike is Highway 160). If coming from the turnpike, you will head East about 9 miles into Oxford (DON'T SPEED) and you will turn south (right) at the Cork 'n Brew (Sumner Rd/Oxford Rd.). We are 2 1/2 miles from the highway on the west side of the road, first house past 30th Street. Look for signs, and the silo and big building. 3). We do give group tours for $3 per person. The tours usually last about 45-60 mins. Just call to set up an appointment or to get special pricing for school groups. HOWEVER, you always get a short tour and are able to see your shrimp being harvested during our regular open hours. We can't wait to meet you all!! Our mission is to produce fresh jumbo shrimp without any hormones or antibiotics. Our shrimp are grown indoors in above ground swimming pools, where they live out their lives in an environment that attempts to mimic the ocean. The shrimp will be sold to you right from the tank - guaranteeing a truly rare and fresh product for our customers. No worries, we'll teach you how to properly cook them! Our sustainable shrimp system is designed to increase production without harming the environment. We reuse nearly 95% of our initial water. We are constantly innovating to ensure minimal waste and more efficient production. We carefully monitor each stage of life that our shrimp go through. 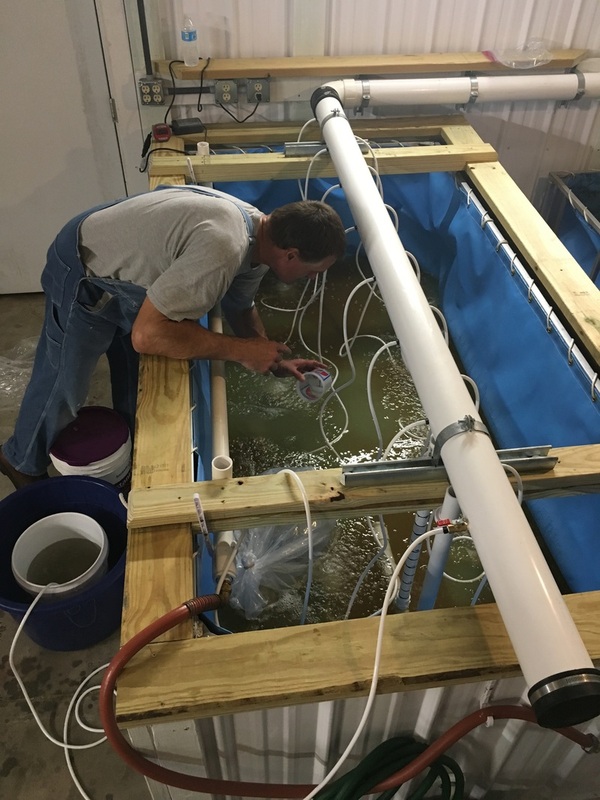 Our indoor saltwater shrimp operation is one of the first of its kind in the state of Kansas. We're bringing the ocean to our landlocked state!